As a disclaimer, I'm aware that this is technically supposed to be done by a licensed electrician. If it's possible to do this project myself, I'm willing to accept the risks in order to save money. This is a 220 volt installation. 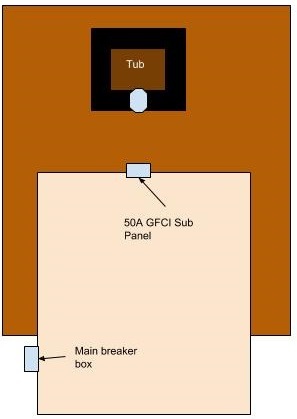 What is the best conduit and copper wire to run from the main panel to the 50A GFCI sub panel? It seems that the cable from the GFCI panel to the hot tub would need to run underground until i reached the bridge, then underneath the bridge, then underground until it is near the hole in the hot tub where the wiring connects, then over ground into that hole to power the tub. Since it's going both over and underground several times, it seems that liquid-tight flexible metallic conduit could work for me. I've taken a look at the electrical codes related to this and I've read that the copper inside of the flexible conduit that will be partially buried going to the tub should be 6 gauge and individually insulated (not sheathed), and there should be 4 color-coded wires total: (1) red & (1) black hot, (1) white neutral, and (1) green (insulated) ground wire.